Get your motor running and head on over to one of our Mister B brandstores or Shop-in-Shops. 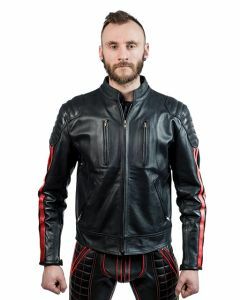 At Mister B we design and make the best leather jackets for gay leather men. 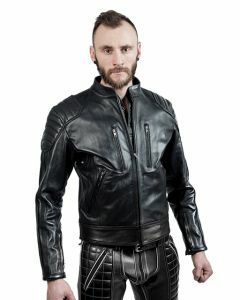 The Mister B Leather Jacket With Belt will drive BLUF members insane and the Mister B Leather Biker Jacket is perfect for all day use, as well as for night-time fetish life. Are you a BLUF member looking to complete your biker or cop look? Check out the Mister B Leather Jacket With Belt. This quality leather jacket has thick heavy lining, two inside pockets, three outside pockets and padding on the shoulders, elbows and waistband. A wide leather belt is included. This leather biker jacket is available in sizes S, M, L and XL. Looking for an all-purpose leather jacket? Then try the Mister B Leather Biker Jacket. Suitable for night and day. Available in black, white, red and grey stripes, in sizes, S, M, X and XL. This beauty is handcrafted in our leather workshop from strong yet supple 100% aniline full grain cow leather. It has four zipped pockets on the outside. We advise you to visit one of our Mister B brandstores or one of our Mister B Shop-in-Shops to guarantee a good fitting. Can’t get enough of leather? Then take a look at out our big selection of leather arm and wrist straps, leather harnesses, leather trousers and leather vests and shirts And if you like to mix things up, you should check out our big collection of rubber clothing and neoprene clothing.